Pat the sausages dry with a paper towel; prick in a few places with a fork. Cut the mushrooms in half lengthwise; cut any large mushrooms into quarters. In a large frying pan over medium-high heat, warm 1 to 2 tablespoons oil until hot but not smoking. Add the sausages and mushrooms and cook, turning the sausages once and stirring the mushrooms occasionally, until the sausages are browned and cooked through and the mushrooms are tender, 10 to 12 minutes. Season the mushrooms to taste with salt and pepper. Transfer the sausages and mushrooms to a plate. Do not clean the pan. While the sausages and mushrooms cook, prepare the remaining ingredients. Trim the root end from the frisée; coarsely chop the leaves. Measure 1 tablespoon [2 TBL] artichoke romesco for the salad; set aside the rest for garnish. Strip the parsley leaves from the stems; coarsely chop the leaves. Divide into two equal portions, one for the salad and one for garnish. In the same pan used for the sausages and mushrooms, if dry, add 1 to 2 tablespoons oil. Warm over medium-high heat until hot but not smoking. Stir in the bell pepper and as many chile flakes as you like and cook until the pepper starts to soften, 1 to 2 minutes. Add the cauliflower “rice,” season with salt and pepper, and cook, stirring frequently, until the cauliflower starts to soften, 3 to 4 minutes. Working in batches if needed, stir in the frisée, baby kale, 1 tablespoon [2 TBL] artichoke romesco, and half the parsley and cook until the frisée and kale wilt, 1 to 2 minutes. Remove from the heat and season to taste with salt and pepper. 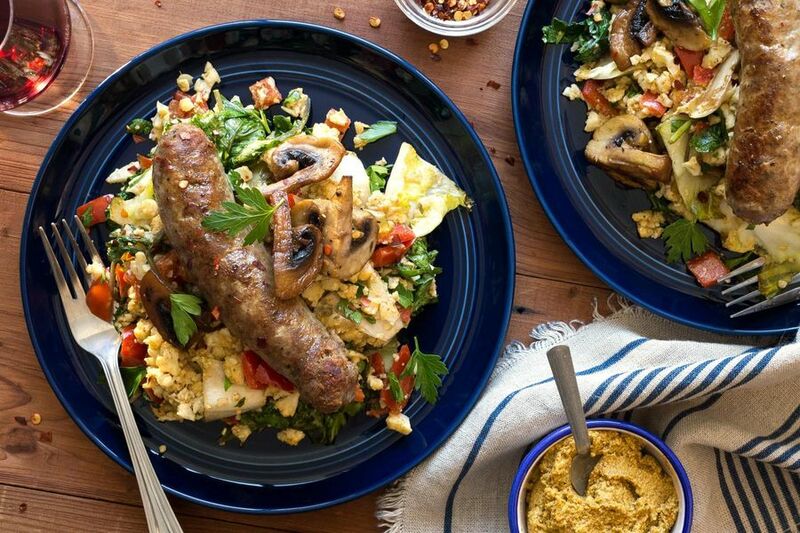 Transfer the warm cauliflower salad to individual plates and top with the sausages and mushrooms. Garnish with the remaining artichoke romesco and parsley and serve. Strip the parsley leaves and divide into two equal portions. In our condiment for Italian sausages, we give classic Spanish romesco an Italian twist with artichokes instead of peppers to create a hearty paleo and gluten-free meal. Originally from the northern Spanish region of Catalonia, romesco is a red pepper sauce traditionally thickened with ground nuts and stale bread. It’s often flavored with paprika, garlic, and vinegar, but the variations are endless. A perfect accompaniment for roasted fish and grilled meats, it’s also delicious as a spread on crostini or as a dip for raw vegetables. Calories: 550, Protein: 28g (56% DV), Fiber: 15g (60% DV), Total Fat: 34g (52% DV), Monounsaturated Fat: 17g, Polyunsaturated Fat: 6g, Saturated Fat: 9g (45% DV), Cholesterol: 70mg (23% DV), Sodium: 1050mg (44% DV), Carbohydrates: 40g (13% DV), Total Sugars: 10g, Added Sugars: 0g (0% DV).